If you should happen to be in St Mark’s Square around midday on the 2nd Sunday of Carnival season, don’t wonder about all the spectators looking skywards, as one of the most important events is taking place in this very same day: the Volo della Colombina/dell’Angelo (the Dove’s/Angel’s Flight). The first Angel’s Flight took place in the 16th century when a Turkish funambulist balanced from the top of the Campanile to a boat anchored in front of St Mark’s Square. 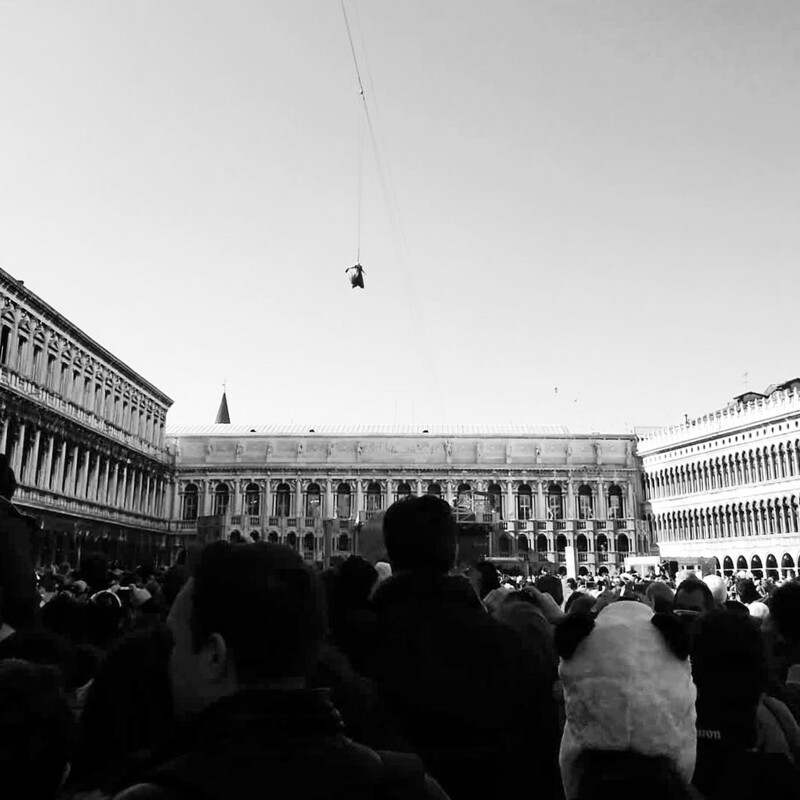 This acrobatic event (thus called the Turk’s Flight in the beginning) had a huge success among the spectators and thus it was repeated every year with professional (first Turkish then also Venetian) funambulists who walked from the top of the Campanile to the loggia (balcony) of the Ducal Palace where they were welcomed, congratulated and rewarded by the Doge. But when, in the middle of the 18th century, this spectacle ended with the death/fall of an acrobat, the city decided to substitute this dangerous spectacle with a symbolic act thus using a wooden dove “flying”(sliding) down from the Campanile: That’s why, still today, this event is called Volo della Colombina the “Dove’s Flight”. 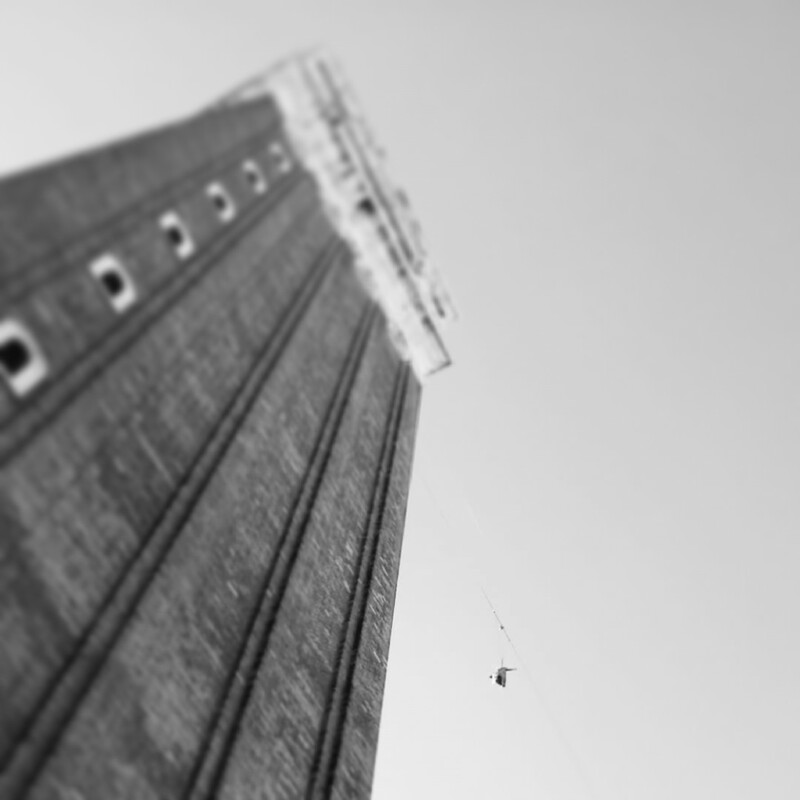 Today a costumed girl (the winner of last years contest of the Marie) flies down from the Bell Tower to the Gran Teatro di Piazza San Marco that is built up for this special event (in case you’re interested in tickets, have a look here). On the third Sunday, means a week after the Volo dell’Angelo, you’ll have the possibility to assist at the Volo dell’Aquila „Eagle’s Flight“ where a famous model, athlete, … (in 2014 Carolina Kostner) will start it’s flight from the Campanile – I wonder who will be flying this year – and in Mestre Piazza Ferretto the Volo dell’Asino „Donkey’s Flight“ that’s making fun of this event.